We stopped for a rest beside the trail. The constant presence of the leeches and their vast numbers was taking its toll. For two days my annoyance had been continually building like a slowly inflating balloon, and things were about to go ‘pop’. I looked at Mike sitting on a rock in front of me wondering how he could appear so calm; surely it was bothering him too? With that thought I grabbed the utility knife from my pack and with a firm but shaky grip on the handle, I thrust it in a downwards motion…. 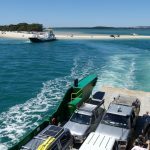 The plan had been to hike the Fraser Island Great Walk, a 90 kilometre walk on the world’s largest sand island off the Queensland coast. 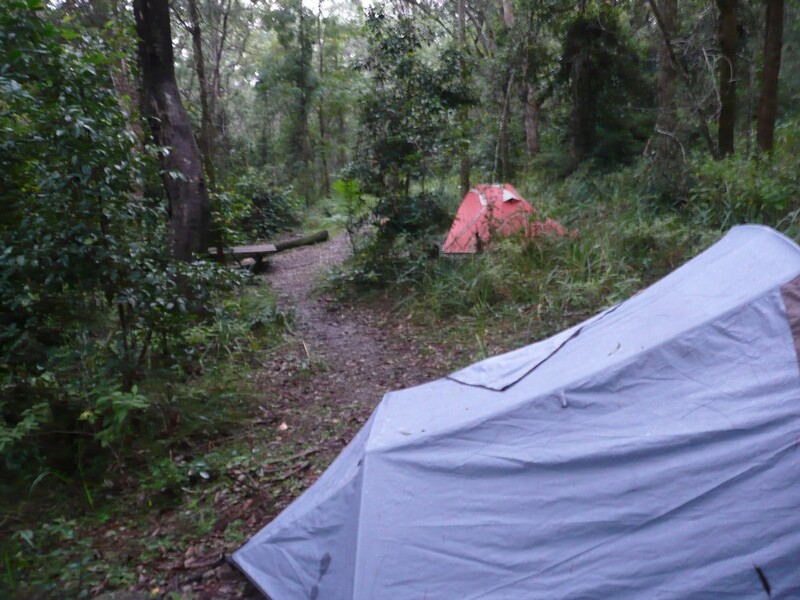 I’d spent several months in eager anticipation, taken time off from work, purchased a new tent and inflatable mattress, nothing could stop us – except National Park Wildlife Service (NPWS) closing the camping grounds indefinitely two weeks before our scheduled walk! Cancelling my holidays or sitting around the house held little appeal. 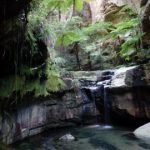 I needed a plan B and with a quick search of the internet, a likely replacement was found – the Conondale Range Great Walk. This 56 kilometre, four-day circuit walk (no car shuffle) is less than 2 hours from Brisbane and an hour from the Sunshine Coast. 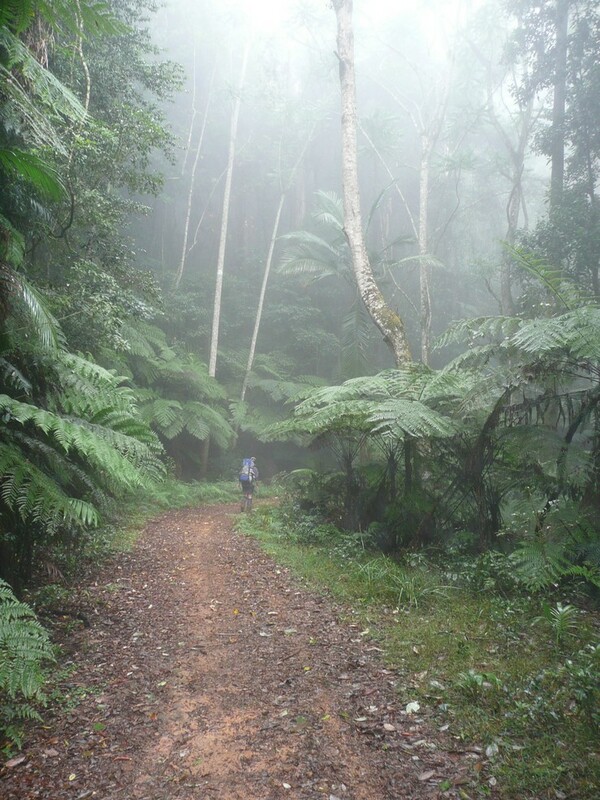 Officially opened in July 2010, the Conondale Range Great Walk became the 10th Great Walk opened in Qld. The Great Walks were a Queensland Government initiative to create a world-class system of walking tracks throughout the very best of Queensland, including four out of five World Heritage Areas. I’m joined on the walk by Mike, a regular hiking buddy. His offer to take his 4wd was a stroke of luck, as my Commodore would have struggled with the causeway crossings entering the National Park, which were well under water from heavy rain the previous week (it would be a good idea to check with the ranger whether there has been recent rain if you plan to attempt this walk). 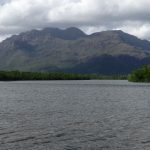 When we went, the previous couple of days had been nothing but sunshine, but for us, the forecast indicated there was a 90 per cent chance of rain each day over the next four days – which just happened to be the duration of the walk! We arrive at Booloumba Creek camping area, the start/end point of the Conondale Range Great Walk, soon after lunch; a little later than planned but Wongai camp ground was a mere 11klms away, so we weren’t concerned. As we left the vehicle and started out, I felt chuffed that my pack was considerably lighter than my more experienced companion, but my smugness diminished with the thought that perhaps I had forgotten a vital item. As we walked to the Artists Cascades, Mike took a fall on the track; there was no damage done but I found it rather amusing. Of course, Karma has a happy knack of biting back, and I had a fall of my own a couple of days later, which left a nice lump on my arm that lasted several weeks. The Artists Cascades are series of small waterfalls and rapids carving a path through the granite rock. 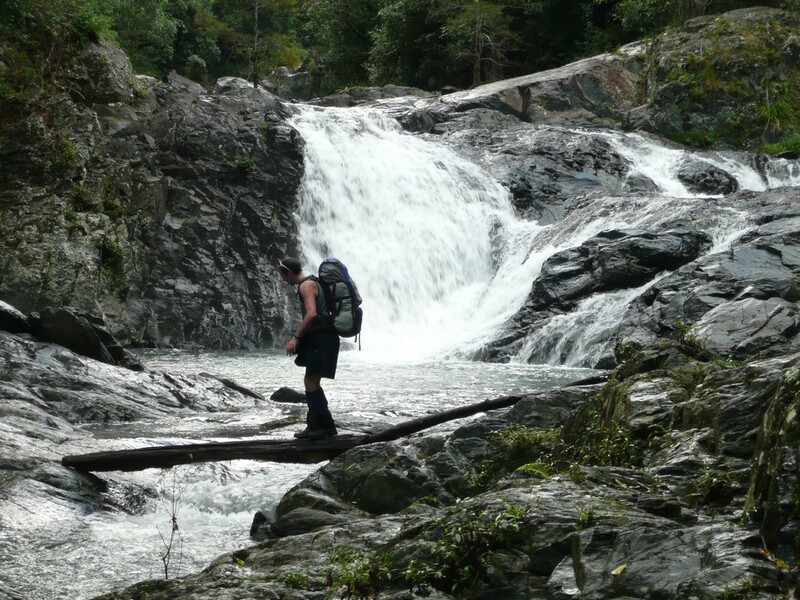 At 5.5 kilometres from the vehicle, the Cascades are a popular return day walk; an easy stroll on flat terrain under the rainforest canopy following the Booloumba Creek, and the soothing sounds of rushing water. While removing our shoes and socks to cross the Cascades we come across another walker. A guy in his mid-40’s and judging by his pack and appearance seemed like an experienced hiker, even more so when he casually waded through the water without feeling the need to remove his footwear. After a quick hello he continued along the trail. From the Artists Cascades the trail changes dramatically with a long steep climb up the valley. We hadn’t exactly factored this into our equation for the afternoon and to quote Mike…’it’s like the Spanish inquisition!’ (that is for those of us old enough to remember Monty Python). In hindsight some pre-walk research would have confirmed this and we would have left a little earlier – I made a mental note for next time. As with any good climb there should be a reward, and the Booloumba Falls and aptly named ‘Breadknife’ – a steep sided rock formation several metres higher than the surrounding granite – are a worthy offering. Even though it was late afternoon, we welcomed the opportunity to down packs and explore the area, and take a quick dip in the freezing water. 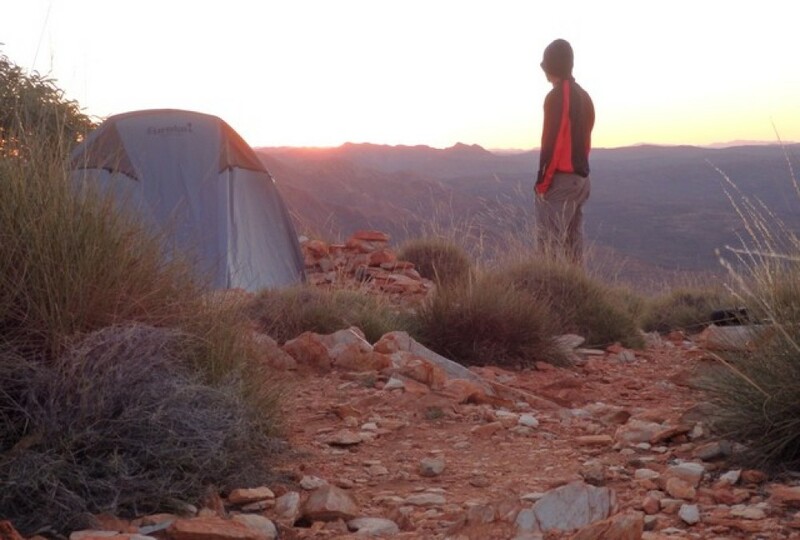 Unfortunately with our campsite still some two kilometres away and light fading, exploration was kept to a minimum. After four hours of walking we had noticed the occasional leech, but given the recent wet weather this was not unexpected. Besides, we told ourselves, how bad could they get? With darkness descending on the forest, the last half hour became a very brisk walk. We reached Wongai campground exhausted and that time of the evening where the light is barely sufficient to see without artificial assistance. I found myself wishing I’d practiced setting up my new tent at home in broad daylight as one should; and even more so when it started raining halfway through setting it up. We were the only campers at Wongai campground that night. Our mystery walker from the previous afternoon was nowhere to be seen, so we surmised that he had exited on a nearby fire trail to a waiting vehicle. So with no-one else to socialise with the next morning and little of interest in the area, we set off on the trail. At 17 kilometres the second day was set to be the longest day. We knew this section of the Conondale Range Great Walk would have some elevation, but nothing like the previous afternoon. The NPWS website had referred to the endangered giant barred frogs, the vulnerable tusked frogs and the rare hip pocket frogs – of which we saw only one specimen during our four days on the trail – but given the number of leeches we had seen, they’re not starving! 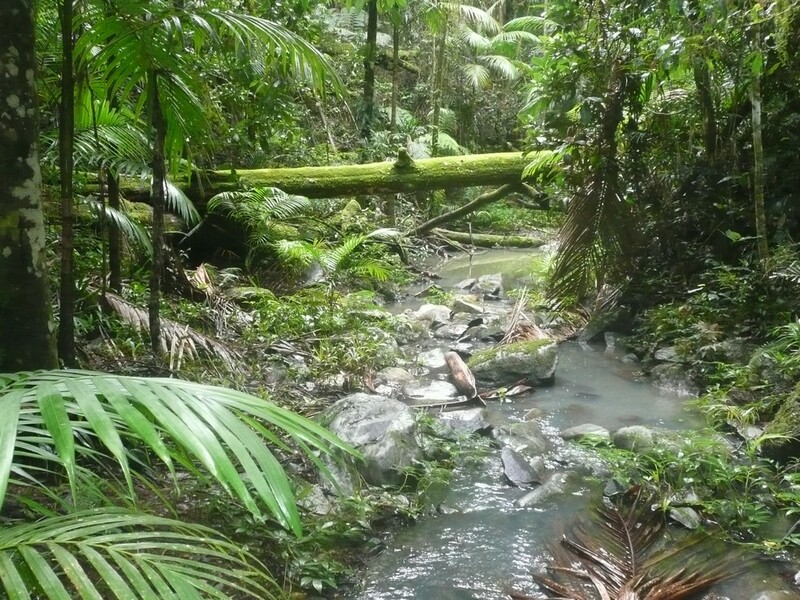 Part of the second day is along fire and forestry management tracks, and even though they’re not pure hiking trails, they’re still very picturesque with rainforest on either side. One of these tracks traverses the very top of the range, dissecting the Brisbane River and Mary River valleys. The forest limits our views into either valley, but at this altitude the low cloud creates a beautiful effect as it floats through the rainforest. We stop beside the track for lunch. As we’re sitting on a conveniently placed log preparing food – and fighting off the leaches that have begun descending on our position – we suddenly hear the unmistakeable sound of a large tree beginning its fall to the forest floor. We stand; ready to flee, unable to determine whether we are in its path. As the tree gathers momentum, crashing through other trees in its path, the noise is incredible. Once we establish our position is indeed safe, we wander over to explore what remains of the forest giant. Sunlight reaches the forest floor through the new hole that’s been created, initiating the race to replace it. In comparison the remainder of the afternoon is rather uneventful; we pass Mount Langley – at 868 metres – the highest point of the Conondale Range Great Walk. We reach Tallowwood campground late in the afternoon and a little more time to put up the tent before darkness descends, although frustratingly, it again starts to rain before I finish. The campground is set amidst a plantation-like forest of its namesake tree, all with tall, thin and incredibly straight trucks. It reminds me of pictures I’ve seen of Germany’s Black Forest. The leeches have not improved. When standing still, it seems as though the forest floor is moving. On arrival at each campground I make a habit of leaving my shoes and socks (one evening I counted forty leeches in one shoe) overnight on the timber decking of the toilet block, and thankfully by morning they’re all gone. Soon after leaving Tallowwood the following morning we come across a disused logging arch beside the trail. It’s one of the few remaining remnants of the logging industry that occurred here before National Park status afforded the site protection in the 1970’s. 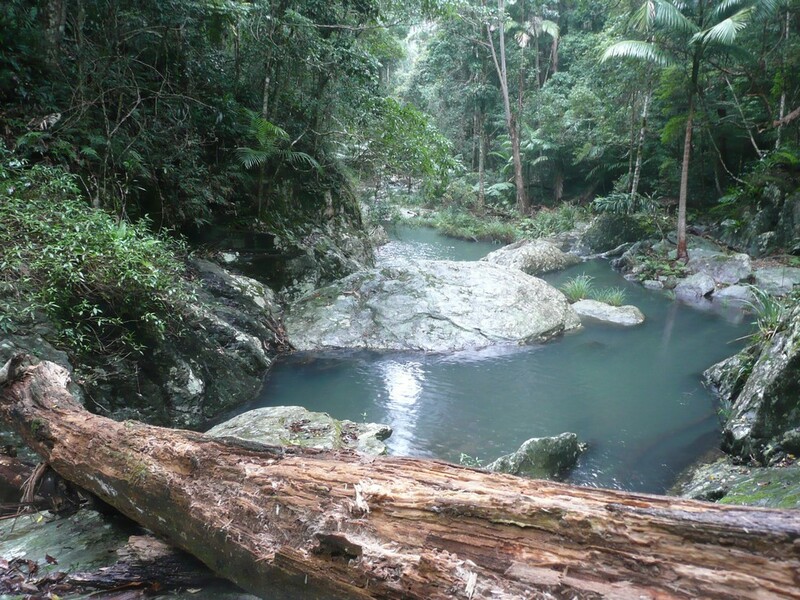 A short distance on is Peters Falls, a beautiful place to explore with several small waterfalls and swimming holes surrounded on all sides with rainforest. It’s also a good opportunity for a swim, which Mike takes full advantage of. Tempting as the swimming hole looked, the combination of freezing water and a cloudy sky stealing the sun’s warmth was enough to keep me out. It was a mid-afternoon rest beside the trail that I finally succumbed, my patience worn through. With knife in hand, I knelt to scrape off the leeches that were now so vast in number they had become seething clumps burrowing into my shoes and feet. Unfortunately, in my attempt to preserve precious blood I managed to slice the end of my finger, thus completely defeating the purpose of my actions. I was being outsmarted by a slug! The third and final night on the walk is spent at Summer Falls campground. The campsite is ideally located adjacent to the falls from which it takes its name. 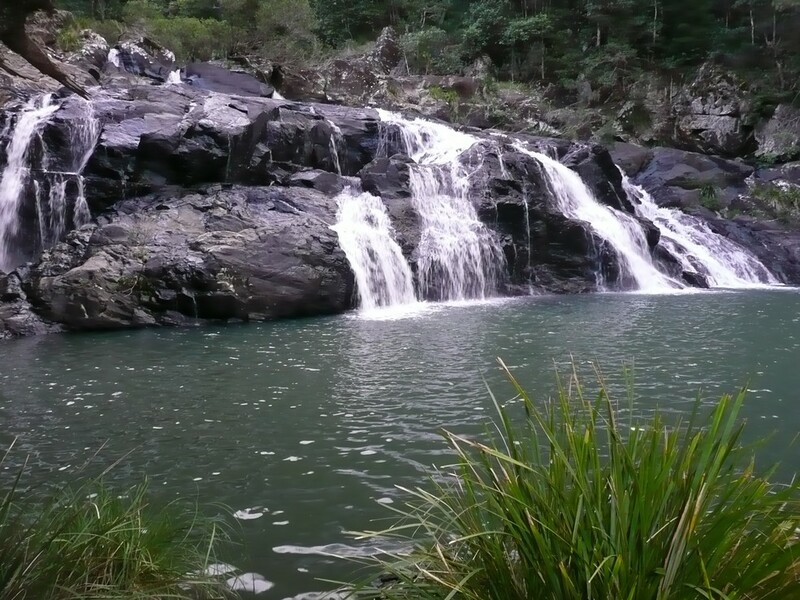 A short distance from the campground one is afforded superb views of the falls and a deep, sweeping bend in the gorge, plus rocky swimming holes perfect for a refreshing dip. This is easily our favourite location on the walk and we wished we had more time to explore the gorge and river in either direction. Not surprisingly, now that I have mastered the tent erection process – it doesn’t rain. Having learnt my lesson from the knife, I’m developing an unhealthy satisfaction for rubbing Bushman’s on the leeches and watching them recoil in obvious discomfort. After dinner we took our first opportunity of a clear night sky to do some star gazing, I should have touched wood when I commented that it would be good opportunity to get some of our stuff dry, because it rained most of the night. Thankfully we awoke to warm sunshine and clear skies; and Mike’s unfounded accusations that I snore loudly. Our morning began with what seems like a long steady climb out of the gorge, but was probably exaggerated with a sore ankle that did not exist the previous day. 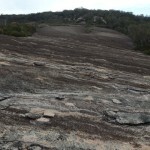 As we climbed higher the vegetation changes to predominately eucalypt and grasses. It was good to see the sun after days under cloud and rainforest canopy and an added bonus – no leeches! While the track through this open section of forest is shared with horse riders – as evident from their ‘deposits’ – we don’t come across any riders. Unfortunately the respite from our blood sucking friends is short lived with our return to the cool shade of the rainforest and the final ascent of the walk, which leads to the Mt Allan fire tower. The timber structure was built in 1954 but renovated in recent years. 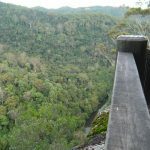 Atop the tower one has superb views of the Conondale Range region and well beyond. We were able to admire our achievements of the previous few days, visually retracing our steps along the walk route. The walk is essentially a horseshoe shape; altitude gained in the first day or so is largely maintained until reaching the Mt Allan fire tower, before a long descent back to the starting point. We start the aforementioned descent knowing we will soon be re-united with Booloumba Creek and the welcoming sound of rushing water not heard since our departure four days earlier. Along the way we took the opportunity to stop and catch the occasional brief view across the valley. Having gained quite a bit of altitude in the first day and a half, we were a little disappointed that we weren’t rewarded with more views from atop the range, but time spent exploring the many creeks, gorges and rainforest more than compensated. Apart from our mystery friend on the first day, we saw not a single person until our return to the vehicle. Perhaps this is due to the walk’s relatively short lifespan. Whatever the reason, the sense of isolation and relatively untouched wilderness on the Conondale Range Great Walk, was a welcome point of difference with its nearby cousin, the more popular Sunshine Coast Great Walk. All campgrounds have a toilet and water tank (although water should be treated), with several individual campsites, each containing a timber platform. Each campsite is spread out, providing some privacy and space from other walkers (should you see any). The Conondale Range Great Walk is hardly remote given the close proximity to the greater population of SE Qld, but you would never know it. You may even see the occasional leech. This entry was posted in Multi day hikes in Australia and New Zealand and tagged Artists Cascades, best bushwalk in sunshine coast, best bushwalks in queensland, best walks in queensland, Booloumba Creek camp ground, Conondale Ranges Great Walk, Hiking in SE Qld, hiking in Sunshine Coast Hinterland, leeches on Conondale Range Great Walk, Mt Allan firetower, Mt Langley, Queensland Great Walks, Summer Falls campground, Tallowwood campground, Wongai camp ground by danthewanderer. Bookmark the permalink. I just stumbled upon your Conondale Great Walk post, I loved it! My partner and I are thinking of definitely doing the track next year some time, perhaps in the cooler(ish) months, and away from leeches haha! I was just asking if there is any tips or advice you could give me regarding this Great Walk. Were not experienced in any way, but we would love to get out there an explore what our wonderful home has to offer! And also, are the walking tracks as such fairly easy to find etc, like.. is there sign postage? Or do you just have to always rely on a map? The Conondale Walk, as with all the Great Walks is very well marked, although we nearly missed the trail exit off a firetrail – too busy talking :-). We bought the Conondale walk map, which apart from a good map & distance measurements, also has information on points of interest, flora & fauna etc. I would recommend taking one with you, you can buy it (or could) from some outdoor retailers in Brisbane & tourist information centres in the area, ie. 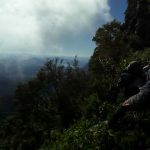 Glasshouse Mtns, Kenilworth, Maleny, Mapleton etc….check this link – http://www.npsr.qld.gov.au/experiences/great-walks/topographic-maps.html. Good on you for getting out there & having a go, best of luck, love to hear how you went. Even on a cold day, it can get cold at the top of the range, so be prepared. Good to hear from you. Check back in a week or so, should have a post on the Fraser Island Great Walk up by then.